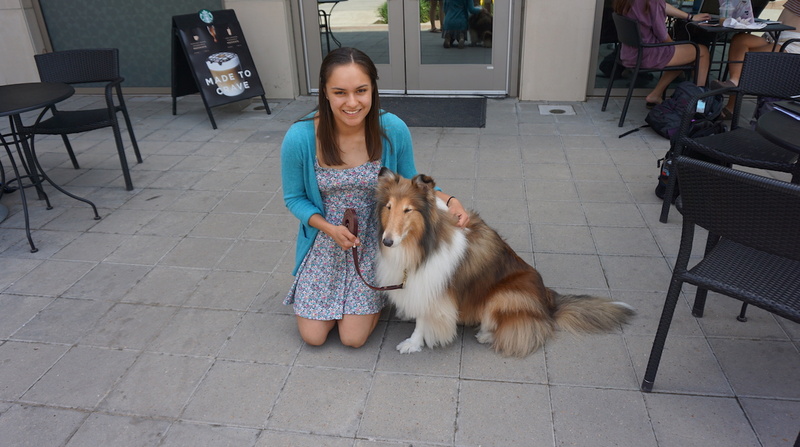 Reveille, Texas A&M’s sweet collie mascot, is the pride and joy of the school. I caught up with Reveille IX and her handler, Mia Miller, during some rare down time. I wanted to know a little more about Rev, as she is affectionately called by Mia. I learned about how Rev became the mascot, what her typical day looks like, and her importance to the university. Since 1966, the mascot at Texas A&M has been a collie dog. The original Reveille was an injured, mixed-breed dog taken in by cadets back in ’31. At that time, dogs were not permitted in the dorms. One morning when reveille sounded to wake up the students, the dog barked and was discovered. The university allowed the dog to remain with the Corps of Cadets, and the pet soon became the school’s mascot. Although her official title is the First Lady of Aggieland, Reveille is also known as Rev, Miss Rev, and even the Queen of Aggieland. Often she is simply referred to as “ma’am” by the cadets. After all, she is the highest-ranking member of the Texas A&M Corps of Cadets on campus! The first pure-bred collie was donated to the university in 1966, and the tradition of Reveille being a collie was born. When the students voted on whether or not to keep a collie as the breed of choice, students felt that the collie was fit for the job of mascot. The Queen of Aggieland is well-suited to her job at the university because she represents loyalty, camaraderie, and, of course, school spirit. Reveille’s handler is traditionally a cadet from Company E2, the Mascot Company. Each spring, cadets try out for the position for the upcoming school year. Freshmen cadets who demonstrate hard work, responsibility, academic excellence, and show knowledge of the history of Reveille and Texas A&M have a chance to earn the honor of taking care of Reveille. Miller is the first female handler in the school’s history. On a typical day, Miss Rev wakes up around 5 a.m., eats breakfast, gets ready, and heads to formation. Following roll call, she relaxes while the cadets train. After accompanying the Corps to breakfast, Miss Rev attends class with her handler. Throughout the week, Rev has various functions, such as leading the Aggies out at football games to the tune of “Power” by Kanye West, one of her favorite songs. Her handler also accompanies Miss Rev to her various campus functions. Miss Rev is often stopped multiple times throughout the day for photo ops and is definitely a celebrity on campus. Students are ecstatic to see Reveille around! According to Mia, “She has a stuffed Bevo that she super loves. She’s not even mean to it. She’s actually really sweet to her toys.” You read that right: Reveille’s favorite toy is the mascot for Texas A&M’s rival, the University of Texas Longhorns! Each week, Reveille goes to Wiggles and Wags, her groomer, where she gets glammed up. Rev is brushed about five times a day! A few things Rev enjoys include car rides, Blue Buffalo treats, and the great outdoors. Rev will always look at the camera when you are in possession of her bag of treats, and, according to Mia, she often falls asleep within just a few minutes of being in the car. 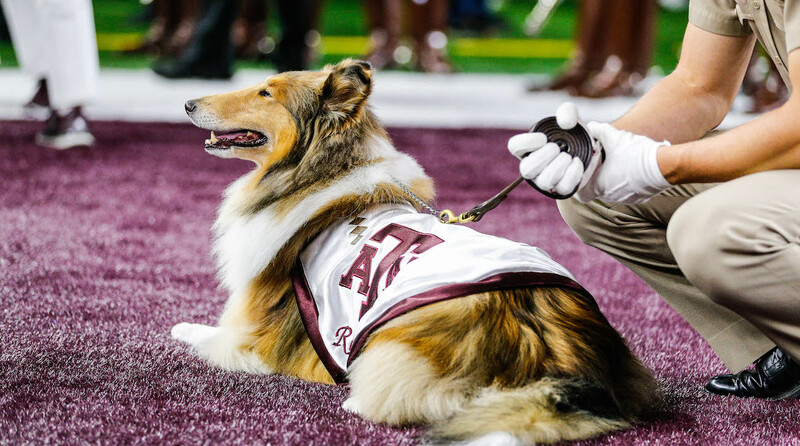 Reveille is not just another school mascot; she is a well-loved and cared-for part of the Texas A&M family and an important element of the school’s rich tradition.